So the past month has been very exciting! I have continued with the ‘Toccotot’ group sessions and have been very privileged to be asked to support and assist children and families in the local area. I have been volunteering my services to ‘The Toby Henderson trust’ and ‘The light and wellness centre and the talking tea rooms happy cafe’..All of which have had great reviews and possibly leading to regular sessions come Sept 15. The summer holiday is beginning to fill up as I have events and sessions booked with ‘Pathways 4 all’ and Hadrian school and in Sept I am looking forward to working with the parents of Hareside school. So are we all aware of the benefits of positive and nurturing touch?..and who its for? Nurturing touch.. massage, whatever you want to call it is beneficial to us all. Whether we are providing the touch to someone or someone is touching you, it all has the same amazing results! The physical connection that we have with another person is extremely powerful. Any touch is great and as long as both people are consenting to be respectful and only provide appropriate positive touch to one another. Holding someone’s hand, rubbing their shoulders, all of which is giving appropriate touch which can make a person feel loved, cared for, respected and valued..resulting in a feeling of self worth and a gained confidence. The ‘Once upon a time’ sessions are brilliant. I have run them with young children, older children, children with a disability or additional need, teenagers and recently with elderly people with dementia. The best part is that they are totally adaptable and can be focussed on a particular subject, hobby, fear, event or situation. Everyone is unique and so the sessions are tailored to the person and familys specific requirements. I have recently been speaking with some fantastic charities, schools, networks and hospices and am hoping to work with them to provide this wonderfully holistic and expressive therapy to more people in the near future. I’m pleased to say that I will be working with the lovely ladies at ‘The Toby Henderson trust’ working with them to support children and families with autism and a small group who find social interaction a challenge. I have also been speaking to the ladies at the ‘Talking tea room’ in Bedlington, which is the 1st #happycafe in Northumberland, and I’m really keen to be able to work with them too. I am thoroughly enjoying this journey and am embracing the path that it is taking me on.. From babies to children, from teens to elderly and everyone else. If you know of anyone who you think could benefit from this, or you would like more info then please get in touch…. Research shows that 1 in every 100 people are diagnosed with an autistic spectrum disorder. This means that 695,000 people in the UK have a diagnosis. 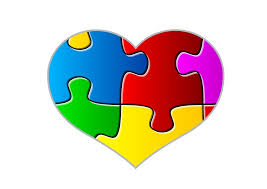 Recently I’ve started assisting families who have autistic children. I’m not suggesting that massage is the answer for all, but as an alternative therapy, I would highly recommend that massage is looked into as an option. When massage is given to someone it has a number of amazing effects on the body and mind. Not only does it feel really nice, but it also has a wonderful effect on both the receiver and giver of the massage. Relaxing- Massage creates a reaction in the chemicals in the body and produces melatonin. Melatonin assists with relaxing and sleep and can be prescribed to aid sleep and the ability to wind down. I feel that a more natural way of receiving the melatonin has got to be through the power of touch and massage, rather than through administering drugs. Alertness and focus- Massage also creates other chemical reactions within us called dopamine and serotonin. These 2 provide an opportunity for a child to become a little more aware and conscious of the world around them. De-stressed and less anxious- When we receive a massage, it can decrease production of the hormone cortisol. This is the hormone that heightens our stress levels, which can have an effect how we behave. Pain relief- Massage increases the flow of blood and oxygen to targeted areas. This provides a warm feeling and can reduce pain levels. Bonding and social interaction- Massage offers a wonderful sense of feelings. Massage releases a hormone called oxytocin. This hormone makes us feel loved, gives us a sense of belonging, provides us with an awareness of feeling valued and helps us to strengthen and reconnect with others and build upon known relationships. Providing the therapy- Whether it’s a parent or sibling giving the massage or child to child experience, the benefits of providing the nurturing touch to someone else can give a real sense of ownership, confidence, contentment and fulfillment, knowing that you are providing a relaxing and calming therapy to another person. Sensory stimulation- Massage can vary and be tailored to individual likes and dislikes. Massage can be administered using firm or soft touch, fast or slow, with or without oils and through finding out more, can be given on specific areas of the body. Massage therapy practitioners may vary on what they are able to offer so you may need to contact a few before finding the right person. As a practitioner myself, I provided sessions and classes to suit the needs of the child and their family, including groups, 1:1’s, home visits and workshops. I hope you found this helpful and it assists you in your decision to try this therapy with your child. I am happy to support you further or answer any questions that you may have. If you would like to find out how the massage therapy sessions can support your child and family, then please contact me for more info.. So yesterday was a very fun day. I along with 4 other local business owners, held a free child related event. 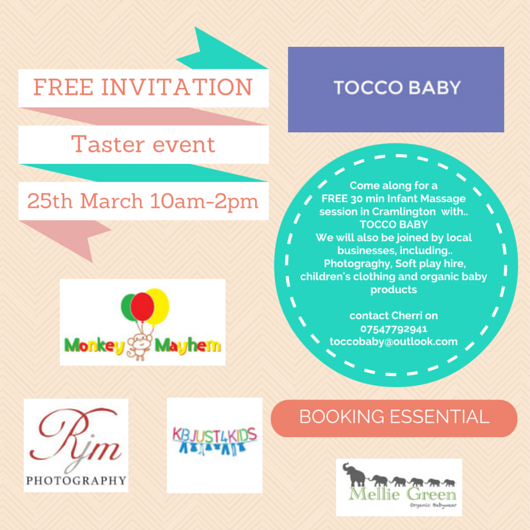 This event offered local families the opportunity to come along and chat to friendly people about hiring soft play, buying children’s clothing, photography, organic baby products aswell as experiencing a taster session of my massage classes. 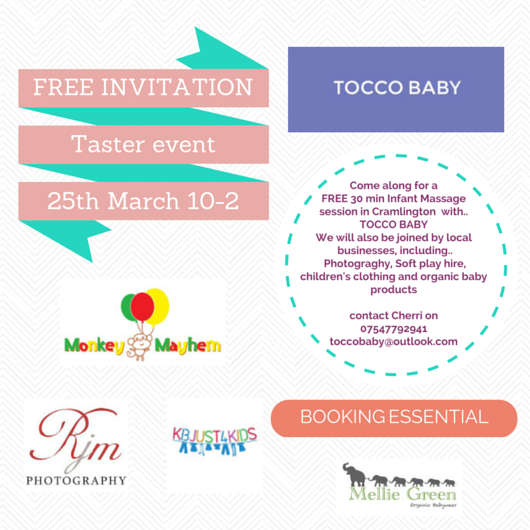 I’m really looking forward to offering some FREE massage taster sessions to local families and sharing the benefits and importance of touch. So it may have been 10 years since I started massaging my 2 children, but the techniques are finally being reciprocated! At the weekend I was invited into my 10 year olds bedroom..I mean spa/salon, where I was treated to an amazing foot massage and manicure..It was heavenly! The pressure applied and techniques were perfect.. So my eldest came home from school yesterday, full of cold and a raging temperature. After popping her in the shower and giving her some yummy pink medicine she fell asleep on the sofa. When she finally woke up the first thing that she wanted was a cuddle and a little tickle on her arms. This just shows how important the feeling of touch is and I believe its even more effective when we’re feeling unwell.The hormones realised create a profound change within the body..and the most amazing thing of it all, is that touch is free! So as much as the sun has tried to shine today it hasn’t really succeeded, so I decided to take the children swimming.. It always brings a smile to my face watching them playing in the water and I love to see them cuddling and touching each other, without a push or a poke in sight. They even took it in turns to lay on a float whilst the other stroked their arms and feet. I think that this is the only time that they are this tactile with each other, except for when they are either lying on the floor or sitting on the chair giving or receiving a massage. These are images that will stay with me forever..no matte how much they can wind each other up the connection and bond that they have at that time is heart warming to see. The sweetest little newborn lifestyle shoot. Welcome to the world, Easton!